If red wine is your beverage of choice, there are some tricks you’ll need to have up your sleeve. Spilling a few drops or even a full glass of your favorite vino can happen from time to time, but if you act fast with the right method, you might just be able to erase all proof it ever happened. Here’s what you need to know before the stain sets in. A little bump at a party and the next thing you know you’ve got red wine all over your ensemble! But don’t stop the party to run home and remove the wine stain. Simply blot (don’t rub!) the stain with a clean damp cloth to lift out as much of the wine as you can. Next, pour a bit of white vinegar on the red wine stain. It will likely remove most of the stain. When the party’s over, be sure to treat the remaining wine stain with a bit of pre-wash cleaner, then wash as usual. The key to removing a red wine stain from fabric on a chair or couch is to treat it quickly. First, blot the excess wine with a clean, dry paper towel. Next, combine dish soap and hydrogen peroxide, then apply it to the wine stain and let it soak in for a few minutes before blotting it out with a clean dry cloth. If this does not remove the stain, repeat the process. Removing a wine stain from tile is fairly easy but, if it soaks in, especially into the grout, it can get a little tricky. To remove wine stains from tile and grout, mix a small amount of dish soap with very warm water and wipe the stain with a sponge dipped in the soapy water. If that doesn’t do the trick, mix bleach and baking soda, apply the mixture to the stain and let it sit for five minutes. Then scrub the mixture into the grout with a clean, dry toothbrush and rinse with warm water. 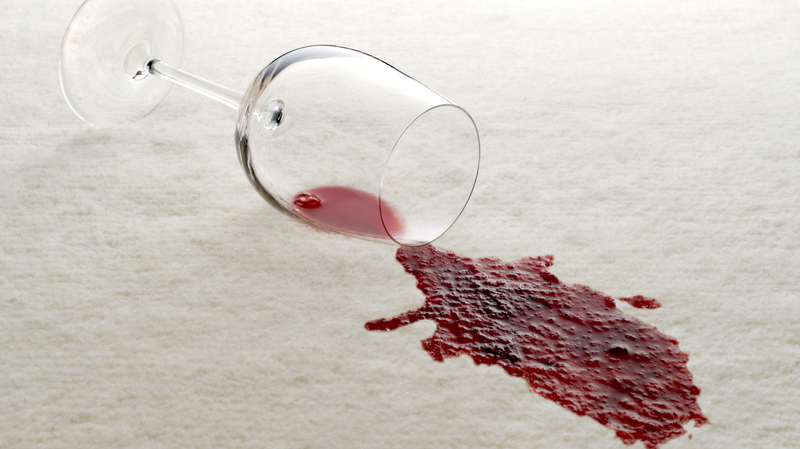 To remove red wine stains from carpet, pour some white wine over the stain to neutralize the red, and then blot up the excess wine with a clean, dry cloth. Finally, treat the stained area with some carpet shampoo and clean according to directions.